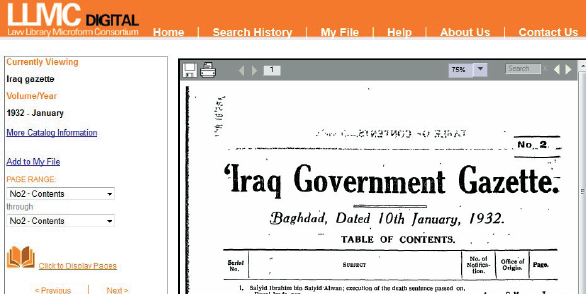 Iraq Government Gazette from CRL’s collection, scanned for the LLMC-Digital database. The presentations and discussions at the CRL-sponsored webinar and panel session suggest that this is an important moment for research libraries, and potentially for the scholars they support. Digital technologies and the Internet have fundamentally altered the ways in which publications, documents, and data produced by governments are distributed and accessed. In the print era, distribution involved a relatively small number of actors. The supply chain then was relatively simple: government data and documents were published in print, microform, and other tangible, fixed media normally by a government printing office, and were acquired, stored, and made available by public libraries, research libraries, and other official depositories. Information considered to have commercial value was often republished and distributed to libraries by commercial aggregators. Today, as documents and data are exposed directly to the web, more actors are involved in the supply chain. Aside from the agencies that produce official documents and information, these actors include the organizations responsible for the technologies used in production and distribution of government information in electronic form: producers of the software, operating systems, platforms, and other tools that enable the storage, display, manipulation, and analysis of the documents and information, and their interoperability with related documents and information from other sources. The new actors include also the nongovernmental entities that reaggregate and provide access to government-produced information, including the traditional publishing aggregators (LexisNexis, Sage, ProQuest) and newcomers like AccuWeather and Bloomberg Government, who build new products and services around government-produced information. In the webinar and the panel session, several presenters referred to the proliferation of Open Access databases and sites, which potentially reduce the need for libraries to mediate access to current content. The digital publishing process itself, however, is fluid and dynamic: instead of producing information in the form of “documents” and other discrete units, agencies output information in the form of XML and ASCII text, video, datasets, and other forms that they can easily and continually update, edit and augment—and even withdraw entirely from the platforms on which they are published. Several presenters noted the failure of many U.S. government web sites during the October 2013 government shutdown. It is clear that the commercial publishing sector will continue to be as indispensable to scholarly access in the future as it was in the print era. With the vast oceans of data flowing from governments today, organizations with robust technical and financial resources are needed to gather, authenticate, organize, and publish government-produced data and digital content, and to provide platforms and tools that facilitate discovery and interpretation. Digitization and archiving of legal materials: Through CRL’s partnership with the Law Library Microform Consortium, targeted content has included U.S. and Canadian legislative journals; African law reports (colonial and post colonial); and materials from Latin America and Eastern Europe, drawing not only from CRL’s collection but also through arrangements with CRL member libraries. Digitization of U.S. government technical reports through the Technical Report Archive & Image Library (TRAIL): The collaborative project, established by the Greater Western Library Alliance (GWLA) and now based at CRL, identifies, digitizes, and provides open access to federal technical reports primarily issued before 1976. TRAIL has digitized and mounted on the open web more than 40,000 full text reports, which comprise a valuable record of technology research and applications in the mid-twentieth century. Digitization and archiving of serial publications of U.S. agriculture experiment stations and extension services: Project Ceres, a joint undertaking of CRL, the United States Agriculture Information Network and the National Agriculture Library, supports digitization of serial publications, many of them products of public universities and state agencies. Preservation of born-digital government information will require a different set of strategies. One appropriate new role for libraries may be monitoring and evaluating the gaps and limitations of systems and platforms used to maintain and distribute government information such as the Government Printing Office’s digital repository, FDsys, and third-party archiving systems such as LOCKSS for Government Documents, the Internet Archive, and the University of North Texas Libraries’ CyberCemetery Archive of Government Websites. It might also involve identifying and evaluating the key databases of government information maintained by commercial publishers, and negotiating favorable terms for purchase of and subscription to same for academic and other research libraries. Collective negotiations will strengthen libraries’ hands in ensuring that the databases deliver the kinds of benefits that best serve scholars, such as comprehensiveness, persistence, and provenance and authenticity of content. Through its Global Resources Forum, CRL has begun to provide independent analysis and venues for information-sharing to support this kind of work by member libraries. In April 2014, CRL will convene its annual Collections Forum, which will further develop a collective agenda on government information for CRL and its member community. The forum, “Leviathan: Libraries and Government Information in the Era of Big Data,” will bring together representatives of government agencies, historians, and members of the research library community, to further determine what role libraries can and should play in ensuring the preservation and future accessibility of the records and publications of U.S., Canadian, and foreign governments. A report from that forum will be published in the summer issue of FOCUS.